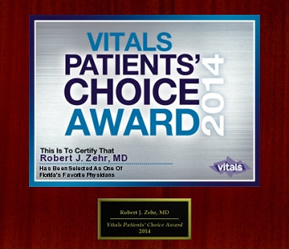 How to identify ACL injuries - Orthopedic Surgeon For Hip, Knee Surgeries at Zehr Center In Naples Florida. In order to properly identify an ACL injury, it is imperative that you have an understanding of the ACL (anterior cruciate ligament) and its function as well as typical activities that tend to result in such injuries. The anterior cruciate ligament (ACL) is a strong band of tissue that connects the femur (thighbone) to the tibia (shinbone). The ACL attaches to the backside of the femur, and goes under the femur, ultimately attaching to the front of the tibia. The femur has a special notch hollowed out at its bottom where the ACL runs across. This special notch is known as the intercondylar notch, and it keeps the ACL in place as it stretches and recoils. 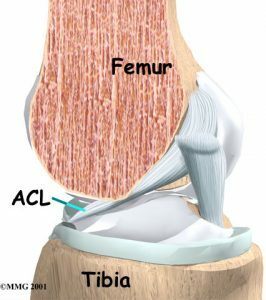 The function of the ACL is to control how far forward the tibia moves. When the tibia is forced to move too far forward, damage can result to the ACL. In extreme cases, the ACL can be strained to the point of tearing. When the ACL is stretched beyond its designed length it is called hyperextended. When it stretches so far that it tears, it is referred to as being ruptured. The causes of ACL injuries are diverse, but most of them are a result of the body moving rapidly with a deceleration occurring quickly causing the hyperextension of the ACL. Activities, usually sporting activities that require pivoting in place, are also a major contributor to ACL injuries. Identifying an ACL tear has much to do with how the knee feels. Many times ACL injuries result in a popping sound or a feeling that something in the knee has popped. Shortly after an ACL injury typically the knee joint swells as a result of bleeding into the knee joint from blood vessels in the ligament that have been torn. One of the main symptoms resulting from an ACL injury is the feeling of instability in the knee joint even after the pain from the injury has subsided. There is a feeling by the injured person that the knee just cannot be trusted. There is trepidation about walking downhill or on ice as well as coming to a stop quickly. Identifying an ACL injury in a timely manner is important because orthopaedic surgeons are seeing evidence that instability in the knee may lead to early arthritis of the knee. These conditions can eventually require total knee replacement surgery. If you, or someone you know, has suffered an ACL injury, call us at (239) 596-0100. 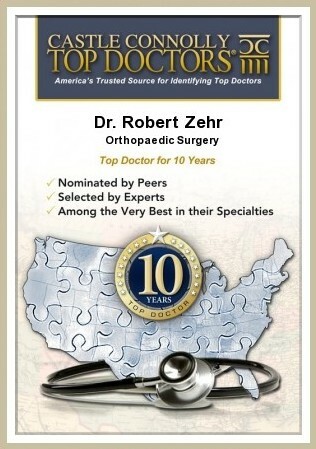 Dr. Zehr is Southwest Floridaâ€™s most skilled and experienced surgeon in total knee replacement surgery. 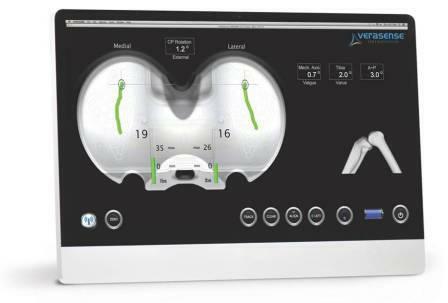 Using custom aligned knee replacement techniques, including the new Verasense sensor-assisted integrated knee system from OrthoSensor, Dr. Zehr is the best orthopaedic surgeon to perform your knee replacement surgery.